Silently resting beneath the surface of the Great Lakes, off the shores of many Michigan communities, are hundreds of shipwrecks, protected by the state and a dwindling crew of volunteers. Michigan has designated 13 underwater preserves, from St. Joseph to the Straits of Mackinac, and from the Thumb to Copper Harbor in the Upper Peninsula. The state also has two federal underwater preserves. The state preserves, which protect sunken ships and natural features, receive no state money. So protecting these sunken sanctuaries is left largely to volunteers with the nonprofit Michigan Underwater Preserves Council, which is based in St. Ignace and draws many of its members from communities near the protected underwater areas. “Our volunteer corps is not expanding. It’s declining and it’s going to continue to decline,” said Ron Bloomfield, past president of the council. He also spent eight years on the state’s Underwater Salvage and Preserve Committee, an advisory panel. Volunteers place marker buoys at the sites of shipwrecks, research the sunken ships, promote the preserves and check on the vessels to “make sure people aren’t stealing stuff off the wrecks,” said Bloomfield, who lives in Kawkawlin Township. The volunteers even raise the money to buy the marker buoys, he said. There are a variety of reasons for the shrinking pool of volunteers, Bloomfield said. Many people move away or get out of diving, he said, and “fewer new divers seem interested in the Great Lakes..
“In addition, our projects are considered to be long-term commitments and the current trend in volunteering is to shy away from long-term commitments and focus on short-term experiences and then move on to the next. Within the preserves are at least 500 shipwrecks, Bloomfield said, and “they’re finding new ones” all the time. “We have some of the best preserved wooden shipwrecks in the world,” he said. Michigan’s 13 underwater preserves include more than 7,000 square miles of Great Lakes bottomland, said Dan Friedhoff, the secretary of the Michigan Underwater Preserves Council. The preserves range from nearly 14 square miles at the Detour Passage Underwater Preserve in the eastern U.P. to 4,300 square miles in Thunder Bay, off the coast of Alpena, said Friedhoff, who lives in St. Ignace. Thunder Bay is a national marine sanctuary as well as a Michigan underwater preserve, and is jointly managed by the federal and state governments. The waters around Isle Royale National Park in Lake Superior also are under federal protection. “We have the same issues as most nonprofit organizations. Lots of people are in favor of what you do, but few have time or inclination to get involved,” he said. 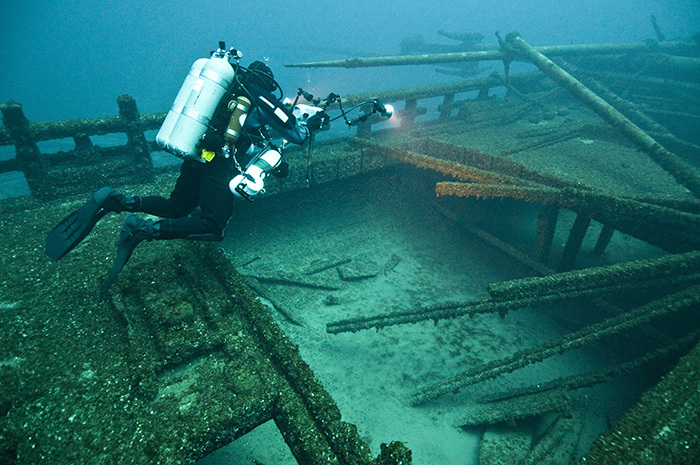 After becoming a certified diver in 2001, Friedhoff learned that all Great Lakes wrecks are not the same. “I quickly became aware of the vast difference between shipwrecks that were discovered and largely stripped before the preservation ethic caught hold, and those that were discovered later, after divers recognized the value in keeping these sites relatively intact,” he said. Volunteers have made strides in educating divers about not hooking directly onto wrecks and instead using moorings placed on wreck sites, he said. “The preserve volunteers also help raise awareness of the damage done by simple acts, like forcing a way through a tight passage or attempting to move artifacts to get a better photo,” he said. The Michigan Underwater Preserves Council and the individual preserves “work to spread the word that even the smallest artifact needs to be preserved,” he said. Volunteers also are important to the success of the Thunder Bay National Marine Sanctuary, said Stephanie Gandulla, who coordinates volunteer activities at the sanctuary. Volunteers staff the visitors center, place mooring buoys and help with events and educational activities, including underwater robotic competitions, Gandulla said. She has the names of about 300 volunteers in her database and has been fortunate to not see a drop off in volunteering, she said. That may be due to the fact that many volunteer tasks at the Thunder Bay facility are less demanding than anchoring buoys, she said. The Thunder Bay sanctuary and preserve is jointly managed by the National Oceanic and Atmospheric Administration and the state. Sandra Clark, director of the state’s Michigan History Center in Lansing, heads the state’s half of the management team at Thunder Bay. That team includes a state underwater archeologist, whose responsibilities include preserving the rich maritime history at Thunder Bay, she said. Since the creation of the state preserve at the Straits of Mackinac, area tourism has been up, said Janet Peterson, executive director of the St. Ignace Chamber of Commerce. But if you look, she said, there are plenty of signs in the summer of divers in the St. Ignace area. She said she’s learned to spot dive decals on vehicles, tourists wearing dive T-shirts and dive gear left to dry outside motel rooms. SHameful that a State that claims “Ownership” of such historical relics takes no responsibility for them. I moved here to start a Commercial Diving School and business because of the water clarity and the bottom conditions. HAve the council contact us we’ ll help where we can.